Rarely do you see a Salthouse 57' offered for sale and this pristine example was the last one to leave the factory for launching in December 2008. Highly optioned by her one owner and maintained by a boatman on a weekly basis to ensure she still presents like new today. The sumptuous interior features gloss timber work and cream leather throughout the saloon which has many concealed features including an electric pop-up dining table. Twin Cummins QSM 11 diesels provide a comfortable cruising speed of 21 knots and will push this substantial vessel to 28 knots when asked. Onboard systems including airconditioning are powered by a 17.5 Kva Onan generator supported by a Victron Inverter for quiet evenings at rest. Accommodation consist of a port side master suite with ensuite, a forward guest VIP island berth with semi ensuite and a twin bunk guest cabin. There is also a trundle double in the enclosed flybridge and the saloon offers extra sleeping if required. You will want for nothing with an aft galley with a servery window and European appliances, dishwasher, washing machine, desalinator, Yacht Controller, fore-deck davit and both bow and stern thrusters. Highly desirable vessel with perfect presentation. Contact Jamie Dodd on 0418819181 to arrange an inspection. Superbly appointed galley with European appliances and custom moulded storage. Domestic upright galley fridge and cockpit U-Tec refrigeration. Cockpit U-Tec and galley upright. Two double suites with a twin bunk cabin and flybridge trundle double. Master suite with a forward guest VIP suite and twin bunk guest cabin. Flat screen TV's and surround sound stereo system. Flybridge aft shade awnings and cockpit storm covers. 4 x Auto Battery Chargers, ICOM VHF, Raymarine E120 GPS and Echo Sounder, Compass, Auto Pilot, Raymarine Radar. 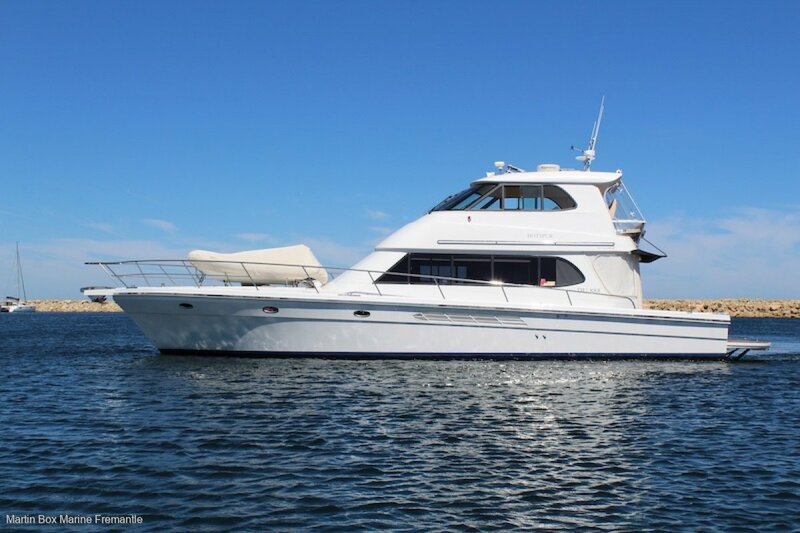 Rarely do you see a Salthouse 57' offered for sale and this pristine example was the last one to leave the factory for launching in December 2008.